Unless you have nothing else that needs to get done, this task can feel interruptive at times. Imagine the convenience your life would gain if you no longer had to manually open the coop door for your chickens. It’s time for you to consider investing in an automatic chicken coop door. What is an Automatic Chicken Coop Door? Do I Have to Replace the Chicken Coop Door that I Already Have? What is an Automatic Chicken Door Opener? Electric vs Solar Power: How Will My Automatic Chicken Door Work? It really is as simple as it sounds. An automatic chicken coop door is one that opens without the need for your manual work. Sounds great, right? It will definitely add a level of convenience to your life with chickens that you may not have realized you were missing. That is just one of your options. There are fully built automatic chicken coop doors that you can buy and install to your chicken coop. If you’re happy with the chicken coop that you already have, or are planning to build your own chicken coop, then finding a whole chicken coop door may be the best option for you. The other option you have, however, is to invest in an auto chicken door opener. Just by reading its name, you can probably imagine what an automatic chicken door opener does. It attaches to your chicken coop’s door and creates the condition that the door can open and close without manual labor. It depends on what type of chicken door opener you’re using. There are different options available. First and foremost, the easiest way to rely on an automatic chicken door opener is if it has an adjustable timer. With a timer, you will be able to completely control the schedule on which your chicken coop door opens and closes. Whether you decide to install a whole automatic chicken door or use a chicken door opener, the question you will need to answer for yourself is if you want it to be electric or solar powered. There are pros and cons to both choices, of course. Using an electric-powered chicken door or door opener means that as long as you have electricity, you will be able to rely on your automatic opening and closing system. But what happens if there’s a power outage? Perhaps your chicken coop is situated in a location where an electric outlet is not accessible. You do have another option. Solar-powered opening systems rely on sun absorption. For example, they may use the sun to charge the system’s batteries during the day. While this is a more environmentally friendly option, sometimes it proves to be inconsistent. It can be tricky to ensure that your automatic system is positioned to receive the amount of sunlight it needs to constantly function correctly. Consider both options and decide which you think will work best for you and your chickens. If you’re building your own chicken coop and searching for a reliable automatic door, then the Auto Door Automatic Chicken Coop Door could be the ideal product for you. Made from heavy duty aluminum, the door will keep your chickens safe from predators without rusting in the rain. This automatic chicken door is very simple to install and once it’s installed, you’ll be granted 3 different operation settings: manual, override, and timer. That means you can tweak your door’s opening and closing schedule based on your daily needs. The door’s motor is hidden so you don’t need to see hanging wires or worry about your chickens eating them! You have your choice of powering the door with electricity or AAA batteries. Power outages will not be an obstacle with this door. Don’t be intimidated by the price of this automatic chicken door. You have to consider what your investment grants you. This chicken door can be used on any chicken coop you will build in the future. It’s a product that will stay with you as you raise many chickens! Looking for an automatic chicken door opener that requires little fuss? Cheeper Keeper’s product will give you just that. Once you fix this automatic door opener to the outside of your chicken coop’s door, you can let your mind wander from the responsibility of opening your chicken’s doors. Cheeper Keeper’s automatic chicken door opener functions with the sunrise and sunset. This means that you do not have to get out of bed at dawn to let your chickens out! This door opener will open automatically at dawn and close itself at dusk. It’s like a babysitter for your chickens. In terms of convenience, this door opener is of the highest level in that it operates on AA batteries. You can situate your chicken coop in the best possible location for you without being tied down to an electricity outlet. With safety features to protect your chickens and varnishes that that will resist impact and weather, this door opener will last you for years. A great option if you’re planning to operate your automatic chicken door with electricity, the Add-A-Motor Chicken Coop Automatic Motor turns any chicken coop door into an easily operated opening and closing system. Not only will you be able to program the time schedule on which your chicken coop door will open and close with Add-A-Motor, but you will also be able to designate specific open and closed positions at which the motor will stop when programmed. With your chickens’ well-being in mind, Add-A-Motor includes a safety connector that will prevent damage if your chicken coop door jams or even gets frozen shut. Once you’ve set this automatic door opener up, you won’t need to think about manually opening and closing your chicken coop doors again. Chickenguard’s ASTx Extreme Automatic Chicken Coop Pop Door Opener gives you prime flexibility. With the combination of a built-in, adjustable timer and a LUX sensor, you will be able to choose how you want to plan your chicken door’s opening and closing schedule. Decide if you want your chicken to open when it gets light and close once it gets dark, or if you want to set a more specifically timed schedule. And don’t worry, any time during the day that you want to adjust the door’s openness, you just use the arrow buttons on the opener to do it manually, for total control. Chickenguard’s door opener is operated with AA batteries which means that you don’t need to worry about depending on any outside source for proper functioning. It even has an LCD display which gives you a low battery warning. Put your mind at ease with the Chickenguard Automatic Door Opener. If you liked the sound of the Chickenguard Door Opener, but didn’t like the price, consider their similar model which is more affordable, if you have a smaller sized chicken coop door. Don’t worry about compromising quality when you pay less. 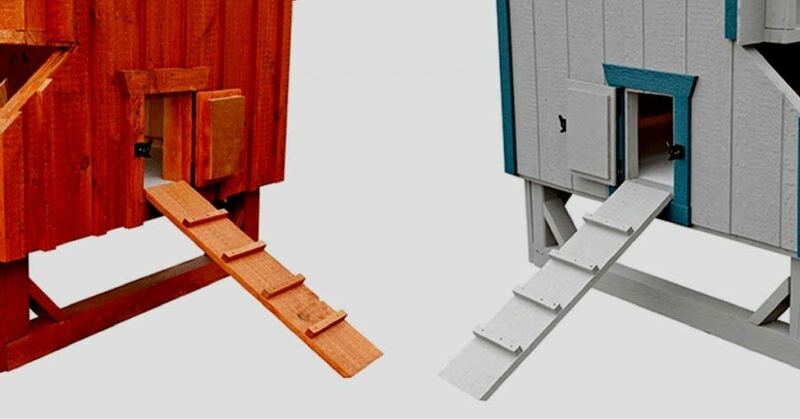 The difference is based on the size and weight of chicken coop door that can be operated by each model. Like its counterpart, this Chickenguard door opener works with AA batteries for the ultimate flexible and convenient experience. Situate your chicken coop anywhere you want without needing to worry about power source. With the built-in timer and light sensor, you will be able to choose how you to control your opening and closing schedule. The LCD display will show you when to change your batteries and indicate when your chicken coop door is closed. This is an ideal product for smaller chicken coop doors. When you’re building a chicken coop, one of the many things you consider is how you can protect your chickens against possible predators. Titan Incubators provides a sturdy chicken coop door, made from metal, that will keep your chickens safe throughout the year in all weather conditions. The installation of your new metal chicken door will be very easy. Once it’s installed, all you need to do is set the included automatic timer for the schedule on which you want your coop door to open and close. No need to worry about outside power sources, the automatic opener runs on AA batteries. Keep them stocked! Rest assured that your chickens will make it inside their coop safely at night. The metal door closes slowly so that all of your chickens will have enough time to get inside and will not be locked out. No more planning your mornings and evenings around closing the chicken coop door! The Brinsea Products Automatic Chicken Coop Door Opener is an affordable option which you will be able to use on any chicken coop you build or acquire. Like its competing brands, Brinsea provides a door opener that creates full control over your coop door when wanted. The choice is yours whether to allow to light sensor to open and close the coop door at dawn and dusk, or to set the integrated timer to a more specific schedule. Either way, if you find yourself needing to change something at a moment’s notice, you can manually control the door with the arrow buttons on the opener. You have a choice of power source, as well, with Brinsea Products. You can power your coop door opener with AA batteries, or if you prefer, you can use a USB attachment to power it with electricity. Flexibility is always a helpful resource. Brinsea Products also manufactures a chicken coop door if you are building your own coop and want to add a quality door. The door is made of strong aluminum and will protect your chickens against predators seeking to harm them. Just as the isolated door opener works, Brinsea Products’ full door set works either with its built-in timer or with the light sensor which opens and closes at dawn and dusk. You also maintain the ability to manually control the door at all times. This door is lightweight, yet sturdy and safe for your chickens. The door is built to withstand extreme weather conditions so that your chickens remain protected and comfortable in all scenarios. It’s your choice whether you want to use AA batteries or USB electric power at any given moment in time for your coop door. Chickenguard also wants to provide their customers with as many options as possible, which is why they too provide a full coop door option. The door is made of strong aluminum with good quality oak runners to facilitate the opening and closing process. With Chickenguard, you will be able to allow your coop door to open and close with the sun’s rising and setting, or execute greater control by setting the built-in timer. The bright LCD screen and large buttons on the door opener make using Chickenguard’s automatic door easy at all times. Operated by AA batteries, this automatic chicken coop door is totally convenient and flexible. Don’t be scared to give this product a try. Chickenguard guarantees your money back, if you’re not satisfied, and also provides you with a 3-year warranty. They care about the satisfaction of their customers. Remember the Auto Door Automatic Chicken Door, the first product on this list? Well, if you liked the sound of that product, but are interested in powering your coop door with the sun, then this is the attachment you’re looking for. This solar panel will provide power to any Auto Door coop products that you own. 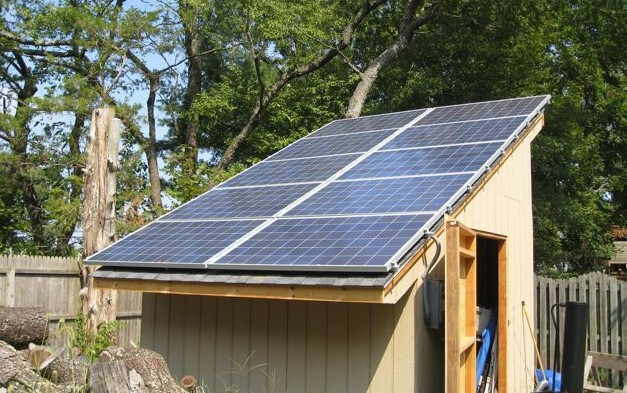 Situating the solar panel is flexible as you can mount it on the wall or stake it in the ground. You will want to make your placement decision based on where the most sun will be absorbed. And no need to worry, the solar panel can be situated rather far from the actual coop door for the best possible sun absorption, as there is a 16-foot cord that attaches the two. Three different colored LED lights will tell you where your battery stands: red for low battery, blue for charging mode, and green for fully-charged. If you have an Auto Door coop door and are looking to save some money and electricity, then this is the right investment for you! That was a lot of information about automatic chicken coop doors and door openers. Now that you understand how these things work and what features they include, you can start to consider what your specific needs are. Your chickens deserve a structured schedule that they can comfortably rely on as they grow and lay eggs. But you deserve your rest, as well! Using an automatic chicken coop door will provide you with the ability to have more flexibility and convenience in your life without losing your control over your chicken coop door’s opening and closing schedule!